The report of the referendum observer group of the Organization for Security and Cooperation in Europe’s Office for Democratic Institutions and Human Rights (OSCE/ODIHR) could have been much deeper and more comprehensive, Lusine Hakobyan, the head of the Europe in Law Association (ELA) NGO, told media Wednesday. Opposition parties in Armenia have largely been pleased with the critical final report of the Organization for Security and Cooperation in Europe’s Office for Democratic Institutions and Human Rights (OSCE/ODIHR) on the December 6 constitutional referendum, while representatives of the government say they “take note” of the criticism. The courts of different districts in capital Yerevan continue to hear a number of cases on electoral violations that allegedly took place during the constitutional referendum on December 6. Almost all of these cases are being examined in speedy court hearings. Opposition members complain that no particular judicial inquest is conducted, which would make it possible to find out why violations were committed, who ordered them and who paid for bribing schemes. Despite efforts to work in a transparent and professional manner, the referendum administration suffered from lack of trust among stakeholders, the Organization for Security and Cooperation in Europe’s Office for Democratic Institutions and Human Rights (OSCE/ODIHR) said in a final report on Armenia’s December 6 constitutional referendum. Independent organizations, which were observing the December 6 constitutional referendum, say that the response of law enforcement bodies, concerning reported violations is belated. A parliamentary petition has been initiated by the opposition Armenian National Congress (ANC) to challenge the December 6 constitutional referendum outcomes in the Constitutional Court. The petition deadline is December 18, a total of 17 signatures have been gathered so far, but 27 are needed for the formal submission. 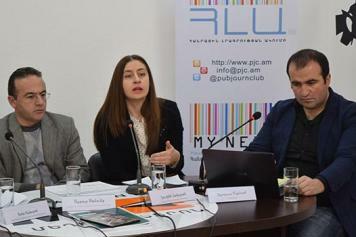 A constitutional law expert in Yerevan believes that the provisions of the amended Constitution are of “better quality” than those in the previous one, but he warns that no improvement in public life should be expected unless these provisions are implemented in earnest. The opposition Heritage party welcomes the initiative of the Armenian National Congress (ANC) to file a claim with the Constitutional Court (CC) against the outcome of the constitutional referendum, but says it won’t join it. The opposition Armenian National Congress (ANC) will challenge the outcome of the December 6 constitutional referendum at the Constitutional Court, the party’s senior member has revealed to media. The United Stated Embassy has welcomed the “public commitment” of Armenian government officials to investigate credible allegations related to the December 6 constitutional referendum, warning, however, that it can “draw upon the information” contained in reports on the ballot in assessing individuals seeking to participate in its programs or activities. The Central Election Commission (CEC) on Sunday reaffirmed victory of the advocates of constitutional changes in the December 6 referendum in a final protocol that was drawn within seven days after the vote as prescribed by law. Over the past week some events took place in the countries surrounding Armenia that may signify the beginning of large regional transformations. The matter first of all concerns developments in Azerbaijani-Iranian relations and Turkey’s attempts to invade Iraq. The campaign on television and radio ahead of the December 6 constitutional referendum has been on for already a week, but not all citizens appear to find it easy to follow. Besides, some observations suggest that the ruling Republican Party of Armenia, which favors the amendments turning the country into a parliamentary republic, had advantage before the start, considering that it had more opportunities to express its position. After nearly five years of war, even now, when Russia is trying to solve the problem through air strikes, Syria’s future remains uncertain. Equally uncertain is the future of the Syrian community of Armenians.